The Gardenfall Floor Fountain Collection by BluWorld offers an incredible variety of stunning and elegant floor fountains. These one panel floor fountains bring a since of calm and elegance to any setting. 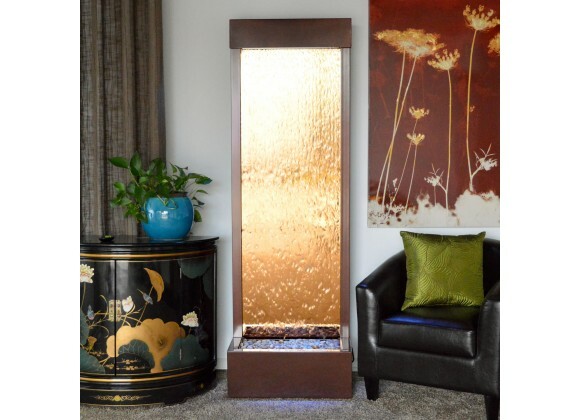 Each of these floor fountains offer a perfect blend of an exquisite frame combined with a sliver, bronze or clear glass panel. These fountains are made from the highest quality of materials and for this reason are able to with stand all weather conditions. This gives the owner of one of these elegant fountains the freedom to place one of the GardenFall Floor Fountains in any indoor or outdoor environment. For instance in a garden the basin of any of these fountains can be buried in the ground which in turn creates the illusion that the floor fountain is sprouting from the ground along with the flowers of the garden. Not only is this floor fountain a sight to behold but it is also acts as a natural humidifier cleaning and purifying the air. Each of the floor fountains by GardenFall includes an intake filter, inline micron filter, polished river stone, an adjustable-flow water pump and a lighting system. All that is needed is water and an 110v outlet in order to enjoy the quite and soothing sounds of the floor fountain. These one panel floor fountains bring a since of calm and elegance to any setting. In a garden the basin of any of these fountains can be buried in the ground which in turn creates the illusion that the floor fountain is sprouting from the ground along with the flowers of the garden. Floor fountain acts as a natural humidifier cleaning and purifying the air. 72" x 24" x 13"